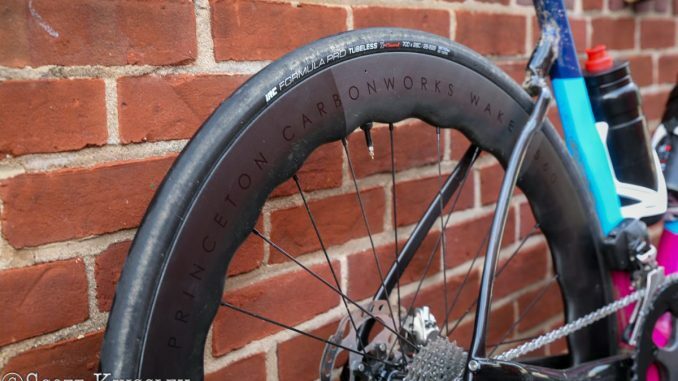 There is a new player in the carbon wheel business, Princeton CarbonWorks, and they have their sights set squarely on the big names of the industry. Their Wake 6560 wheel has a unique rim shape and they make some bold claims when it comes to aerodynamics, but they also have the data to back it up. We had a chance to catch up with Co-Founder and COO, Paul Daniels for a test ride on his local roads outside of Philadelphia on the disc version. This will be our initial feelings, and we’ll follow it up in a few weeks once we have a chance to put some serious miles in on our local roads a little further west in Pennsylvania. We’ve mentioned them before in a custom build for absoluteBLACK’s Tony Brandotti and also in the UCI Approved List from Early April, so the name shouldn’t be new. We’ll get into their history more in the full review, but the quick version is Princeton CarbonWorks was founded by four former rowers that at one point or another were part of the US National Rowing program. As many rowers do, they turned to cycling and triathlon once their rowing days were over. The group wanted to create a better wheel that was more attainable to the masses than the current high end offerings, so the engineers of the group put their experience in mechanical and aeronautical engineering to use, and came up with something very unique. Sinusoidal oscillation is a repeating wave pattern that uses the same amplitude for the peaks and valleys over and over again. The Wake 6560 uses 24 of these waves to create a variable height rim design that is 65mm tall at the spoke hole and 60mm tall at the valley in between the spokes. The Sinusoidal wave pattern makes for much more than just a striking rim. Adding the Wake 6560 to the Van Dessel Motivus Maximus LTD makes and already fast bike even faster. Favorite Rides – Quiet country roads of Amish Country, some of the best roads around.